R.J. Rushdoony: 00:02 Deuteronomy 18, verses 9 following. God versus Moloch. R.J. Rushdoony: 00:14 Deuteronomy 18, verses 9 following. When thou art come into the land which the Lord thy God giveth thee, thou shalt not learn to do after the abominations of those nations. There shall not be found among you anyone that maketh his son or his daughter to pass through the fire, or that uses divination or an observer of times, or an enchanter or a witch or a charmer or a consult with familiar spirits, or a wizard, or a necromancer. For all that do these things are an abomination unto the Lord, and because of these abominations, the Lord thy God doth drive them out from before thee. Thou shalt be perfect with the Lord thy God, for these nations which thou shalt possess hearken down to the observers of times, and unto diviners, but it’s for thee the Lord thy God has not suffered thee so to do. The Lord thy God will raise up unto thee a prophet from the midst of thee of thy brethren, likened me. Unto him, he shall hearken. R.J. Rushdoony: 02:20 When a prophet speaketh in the name of the Lord, if the thing follow not nor come to pass, that is the thing which the Lord hath not spoken. But the prophet hath spoken it presumptuously, thou shalt not be afraid of him. R.J. Rushdoony: 02:40 In Deuteronomy 18 verses 9 through 22, a variety of practices are cited as forbidden, all of which are with respect to knowing and controlling the future of man and the world. There are a variety of practices; there are necromancers, that is those who speak to the dead; spiritualists, trying to get a message from the dead; there are those who are diviners, who through various forms of divination attempt to know the future; witchcraft or magic and so on. Virtually every particular form of attempting to know the future is here cited except one, which did not as yet exist in that part of the world. Astrology. But astrology is later cited by the prophets as being covered by these regulations. R.J. Rushdoony: 03:50 Now at the head of the list is one particular form, which sums up in essence all these attempts, to have power over the future. There shall not be found among you any that maketh his son or his daughter to pass through the fire. This of course is dealt with in numerous other regulations, and it is defined for us very specifically as Moloch worship. It was Moloch worship, MOLOCH, sometimes spelled MOLECH, that this and other Scriptures had referenced to. R.J. Rushdoony: 04:42 Now we cannot begin to understand the significance of Moloch worship, with its demand that children as sacrifice, until we begin to analyze the meaning of the word Moloch. The word Moloch is the same as the word which still appears in various of the Middle Eastern languages as Melech, Malek, Maloch, and in various Western European countries as Melcolm and Malcolm. Its meaning is “King.” It’s a very common word. It very often appears in various legitimate forms, but here it has reference to a Ba’al, a god. R.J. Rushdoony: 05:46 And the name of this god, Melech, or Molech, or Moloch, meant “King.” Moloch worship was state worship. The state claimed to be the true and the ultimate order, and religion was a department of state. The Moloch state claimed to have total jurisdiction over man, and was therefore entitled to total sacrifice. It had absolute right over the life of man. R.J. Rushdoony: 06:27 Now this of course may sit very telling in terms of our modern culture. Because the modern state is a Moloch state. It claims total jurisdiction over the life of man, over his income, over his light, over his property, and feels it can claim his right to live, to expropriate his life at will, apart from the law of God. But, the Scripture makes it clear that no man has any right over another man’s life, apart from the word of God. R.J. Rushdoony: 07:23 One of the related commandments is in Leviticus 19:26. This is a single sentence, and listen to it. You shall not eat anything with the blood, neither shall ye use enchantment nor observe times. That, to the modern American as he hears this sentence, it seems as though two completely unrelated ideas are brought together, and so this is an illogical sentence. First it forbids eating anything with blood, so that whatever animal is eaten has to be bled first. And then it says you shall not indulge in spiritualism or astrology, or anything that involves an ungodly probing into the future. 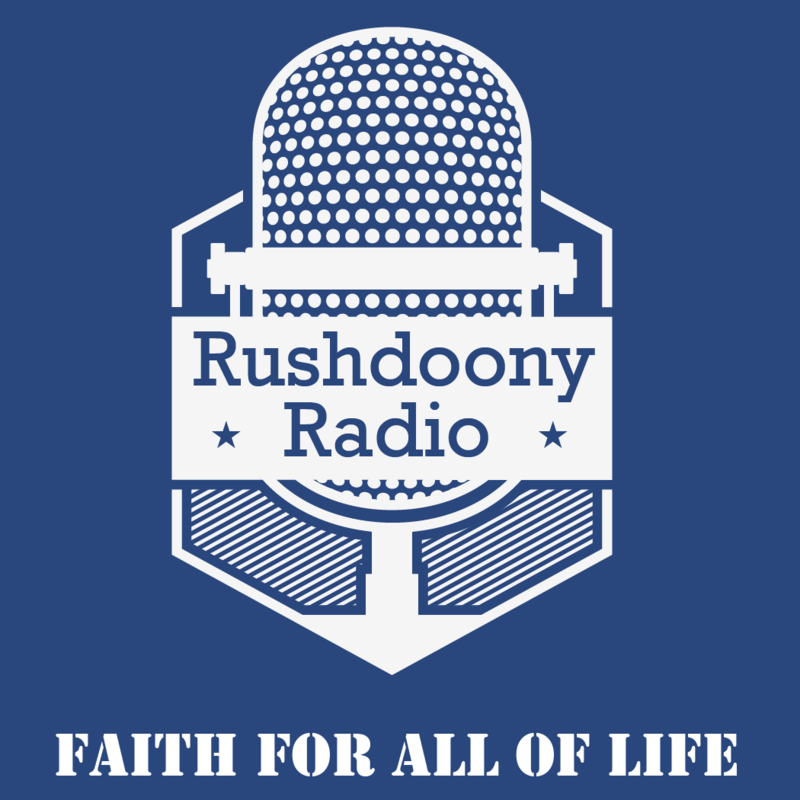 R.J. Rushdoony: 08:21 What do the two have in common? Now read [inaudible 00:08:27], concerning eating anything with blood in it, goes directly back to a number of commandments in the Bible which we will deal with more next week. But these commandments required that whenever man killed to eat, he did it only in terms of the law of God and by the permission of God. So the animals which were legitimate food were specified. The laws had the help of man. His life in mine, and so certain types of animals were forbidden. R.J. Rushdoony: 09:04 Then, because all life comes from God, life can only be taken on God’s terms, and therefore as man kills to eat, that blood must be spilled upon the ground, and then covered over, in order that it might be returned unto God by His permission, and then the food eaten with thanks giving, so that every [inaudible 00:09:40] taking of meat constitutes according to Scripture an act of thanks giving, a kind of communion meal with God, and hence the necessity that it be eaten with thanks giving, which is specified in Scripture. St. Paul makes it emphatic. R.J. Rushdoony: 11:02 Similarly, it claims the right to take your income, and contend with the law of God. It claims the right to govern you from cradle to grave in contempt of the law of God. In other words, it claims total right to your life, and this is Moloch worship. R.J. Rushdoony: 12:42 And so he told them the consequences of their course of action, their rejection of God. What would happen now that the state was being made king? And in I Samuel 8, verses 11 through 18, God declares the consequences of this rejection. And he says because they are choosing another king, in effect, by implication another God, even though they claim they are not. R.J. Rushdoony: 13:21 First, he says there will be conscription. Second, there will be compulsory labor battalions. Third, there will be conscription of young women as well as men. Fourth, there will be an expropriation of property and livestock. Fifth, the state will demand the tithes like God as its tax. R.J. Rushdoony: 13:53 Now this is an interesting point. God declares that when a state demands as much as 10% of anyone’s income to support itself, it is challenging God, it is denying God, because God alone has the right as the absolute Lord and Landlord, to demand that much of man. R.J. Rushdoony: 14:19 But today, the state requires far more than 10%. It is well over 40% that all state, federal, and local taxes take of one’s income. And sixth, God declares He will not hear a people who complain about paying the price of their sins. R.J. Rushdoony: 14:44 So the day will come, He says, when the consequence of having abandoned Me will bring upon you all this oppression, and when you reach the ultimate of this oppression, you shalt cry out unto me and I will not hear you. You will pay the price. R.J. Rushdoony: 15:09 The Moloch state, therefore, represents man’s supreme effort to command the future and to play God, to have himself as the other God before God. Now, in a related passage, in Deuteronomy 13, Moses goes into greater detail about the false prophets. And he declares that there are three kinds of instigators to idolatry, and Deuteronomy 13 verses one through five, he says there is an instigation to idolatry by false prophets. Second, in verses 6 to 11, by private individuals; and third, in verses 12 through 18, via cities, via communities. And he declares there must be, in all three cases, the death penalty without mercy. R.J. Rushdoony: 16:26 Now the death penalty is not required for private belief; in other words, the person can privately in his heart be an idolater or an atheist. But it is for attempts to propagate idolatry, to subvert the social order. Similarly, this law is not for a missionary situation, but in a Christian society that has established itself upon God’s law order, then such a society has an obligation to invoke the death penalty against all those who attempt to subvert it, because this is then the basic treason. R.J. Rushdoony: 17:19 Every law order has a concept of treason. A betrayal of its fundamental law order. It either punishes such treason by death or it commits suicide. Now criminal offenses always exact a penalty. Every time a crime is committed, there’s a penalty. It makes no difference whether the crime is great or small, every crime has a penalty. If it’s a pencil that’s stolen, the person who owned that pencil is penalized to the extent that they have to replace that pencil. If it’s a million dollars stolen, the person who had that million or the institution who had it is then penalized. The only question is, who is penalized? Is it the criminals? Or is it the victim? R.J. Rushdoony: 18:36 According to Biblical law, restitution is the requirement. The criminal is penalized. In our society today, we are penalized. We are robbed, and then we have to pay to support the criminal in jail by means of taxation, so that we are doubly penalized. We lose that which we were robbed of, and then we lose the [inaudible 00:19:14] in taxation. Every criminal offense always exacts a penalty. And we live today in such an age that the penalty is almost invariably paid by the victim. R.J. Rushdoony: 19:36 Now crime also exacts a social penalty as well as a personal penalty. The law order is breached. The peace and health of society are broken. If in a classroom a child cheats, and a child gets an undeserved grade, everyone in the classroom is affected, because the whole order and the rank and the grading of the classroom is affected in that someone has an eminence, a position that is undeserved. And the law order of that classroom is broken. Or if the child speaks out of turn and gets away with it, the peace and quiet of all is disturbed. R.J. Rushdoony: 20:40 Basic to any society is the integrity of its foundations. And if a society allows its foundations to be attacked, then it perishes. The Marxists make it clear, that if you’re going to attack Marxism you’re going to die. That is not the sin of Marxism. If this were the only thing the Marxists did, we would have to say there’s a good sense in their procedure. Because they are simply recognizing that this is their foundation, Marxist philosophy, and they can never survive if they allow Marxist philosophy to be attacked and to be denied and repeatedly [inaudible 00:21:37] to try to convert anyone away from it. R.J. Rushdoony: 22:00 … have no other gods before me. Nothing more totally destroys the society than a breaching of this faith in a Godly society. But of course, this is no longer the faith of our society. We are a humanistic society and we are in a missionary situation. We have to convert and to reestablish as against these false prophets, false mediators from the diviners to the necromancers, to the Molech state and the false prophets, all of whom claim to be God’s and man’s true mediator to salvation and to happiness. The true prophet is cited in Deuteronomy 18 verses 15 through 19. God says, “I will raise up unto thee a prophet from the midst of thy brethren like unto thee, very man of very man.” Like unto me, like unto Moses, a law giver who speaks for God, unto him ye shall hearken. R.J. Rushdoony: 25:05 In the concluding passage of the 18th Chapter, Moses turns to the false prophets. The false prophets, when he speaks a thing in the name of the Lord, claiming to be a faithful servant of God, if the thing follow not nor come to pass that is the thing which the Lord hath not spoken that the prophet has spoken it presumptuously, thou shalt not be afraid of him. R.J. Rushdoony: 27:05 This is anarchism and it is Molech worship in which every man makes himself his own Molech and says, “All things must be sacrificed to me. All law and order, all humanity because I deem it so.” One of the aspects of Molech worship that is very significant is that as a part of the paganism it represented, all kinds of strange sacrifices of humanity were required of man. Not only the sacrifice of the human feeling of surrendering one’s children to be burned on an alter before this image, but also all kinds of mutilation, all kinds of denials of humanity. It became a part of this kind of [inaudible 00:28:28] worship to have as well priests that were castrated. It was a denial of humanity, an attempt to be as god by surpassing humanity. This was a deep impulse in the ancient world, a part of its humanism. Because when men deny god, the essence of humanism is that it makes man to be god. R.J. Rushdoony: 29:05 There is a legend concerning Empedocles, the Greek philosopher, that in his old age, he decided to be a god and so he climbed up onto Mount Etna and flew himself into the crater of the volcano to be a god. It was his form of Molech worship. And today all over the world, whether it is the totalitarians or the anarchists, self destruction is the method by which men are seeking to be as gods. Against this we must declare God said, “Thou shall have no other gods before me.” For apart from Him, man cannot live and his course becomes self destruction. Let us pray. R.J. Rushdoony: 30:23 Our Lord and our God, we thank Thee for Thy word and we thank Thee that Thy word speaks to our condition and gives us strength to live to overcome the trials. We thank Thee, our Father, that we can face all our todays and our tomorrows in the supreme confidence of victory. Bless us to this purpose. Grant us Thy peace and Thy guiding and provident care that in all things we may be more than conquerors through Him that loves us, He in Jesus Christ, our Lord. In His name we pray, Amen.